If you are considering the ultimate home theatre experience, the biggest attraction and main draw would be the screen. For the screen, size and image quality is always a key factor. 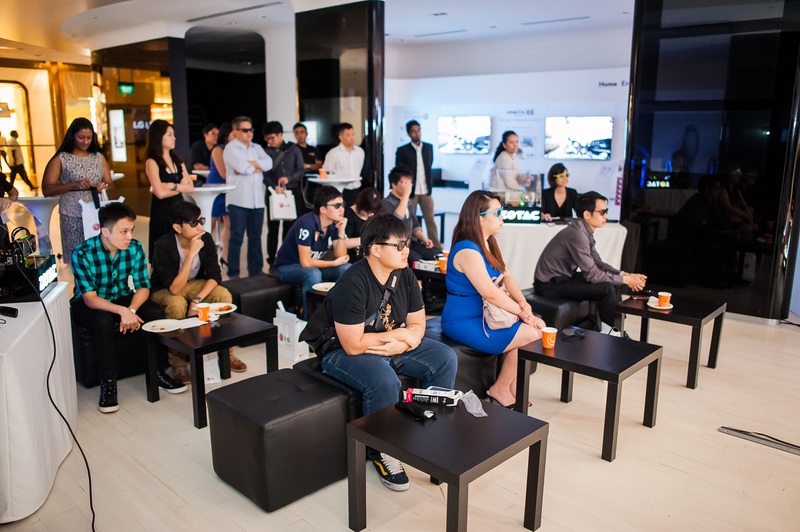 LG Electronics recently showcased the 84LM9600, at the LG Live Store at Marina Bay Sands, The Shoppes. The TV offered a whole new level of picture quality, breaking new ground in the entertainment arena, and offered a solution to blend the size and image quality criteria together. The advent of Ultra High Definition Televisions (Ultra HD TVs) has brought an enhanced home viewing experience with greater clarity and detail. As mentioned, size of displays at the larger end has always been fulfilled by projectors, but even so, limitations in terms of viewing conditions, lighting, and display contrast prevailed. A good article depicting projectors vs LCD/LED TV can be read here. To put things in perspective, an 84″ TV can be considered to be made up of 4 x 42″ screens, and the resolution is 3840 x 2160, or more commonly known as 4K resolution. 4K is a new video format that uses an image with a resolution comprised of roughly four thousand vertical lines, hence the acronym 4K. To put this in perspective, a standard high definition image has a resolution of 1920 x 1080 and is capable of delivering an image comprised of just over 2 million pixels. However a 4K image, can deliver an image that is comprised of a whopping 8.3 million pixels. 4K content is still limited, but just like 1080p content a couple of years ago, the technology adoption rate will rapidly increase. For now, the easiest 4K content available for main consumers would actually be games. 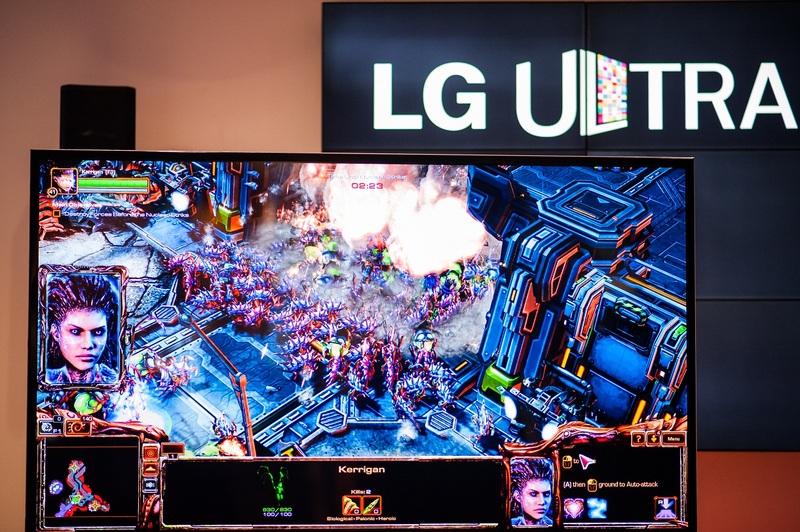 “With the availability of 4K resolution computer games, consumers are eager to witness what the next-generation resolution capability holds in comparison to the Full HD experience that they are familiar with,” said Mr. Scott Jung, Managing Director of LG Electronics Singapore. Don’t forget, a similarly powerful PC would be required to support the 4K, 8.3 million pixels output. At the showcase event, the artistry and cinematic brilliance of game contents were expressed in ultra detail and clarity on the gigantic 84-in screen as Tammy Tang (aka “furryfish) played through StarCraft II: Heart of the Swarm’s brand new single-player campaign and provided attendees with a glimpse of the game’s thrilling real-time strategy gameplay. Just like its grand size and stunning picture detail, the LG 84-inch Ultra HD TV also delivers some of the richest, fullest sound ever to come from a TV. You can experience the brilliant opus of 2.2 Sound System with two 10W speakers and two 15W woofers. In addition, the 3D Sound Zooming feature, which analyses the on-screen objects to generate sound according to their location and movement, complements the extraordinary visuals on the massive screen. However, if you can afford the space and the dough to purchase this TV, I would be very surprised if you rely on the built in speakers. It is like pairing a Ferrari with bicycle wheels. The LG Ultra HD TV (84LM9600) retails at S$24,999 and is available in Singapore already. So to answer the original question of whether or not you should purchase a 4K TV today, I will again say both “yes” and “no”. If you are one of the few people in the world who can afford to purchase a 4K TV over a brand new car and you love being on the cutting edge of technology, then by all means, yes; purchase your first 4K TV. While 4K content is currently lagging a bit behind the hardware, this has always been the case, as it was when HD TVs were first introduced. No: Because both hardware and content are not mainstream yet and patience will benefit the average mainstream adopters. The year 2014 will see a surge of 4K releases and will increase steadily over the years until they become as ubiquitous as 1080p releases are today.